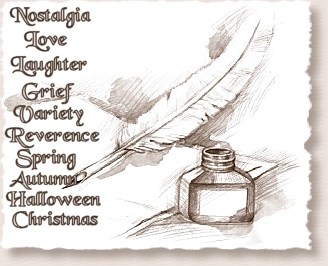 Scroll down to read poems of Nostalgia, Love, Laughter, Grief, Reverence, Spring, Autumn, Halloween, Christmas, Guest Poets, and Various topics. Click Back on your browser to return to this page, or if you'd like to start at the beginning, click Here. My most popular poem: The Wreck On Highway 109 (found in The Variety Rooms). **Please Note: This site was not created to view well in hand-held devices. Christmas Granny My Christmas Memory Whatever Happened To Christmas-Past? Santa's Magic Dust Snowman Fun It's Christmastime! drenching the soul with tears. gleaned from a lifetime of living. **Two short stories that I wrote are published on Storymania. This site is best viewed in Internet Explorer browser, large screen monitor. special effects on the poem pages. **This site was not created to view well in hand-held devices. 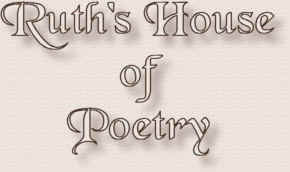 All pages in Ruth's House of Poetry were created by me using Front Page software. solely to illustrate the contents herein. Please do not take. Graphics were made, using Paint Shop Pro. Unless indicated otherwise, artwork found on the pages came from CDs I purchased. Some of the pictures and tubes and some of the backgrounds were found on the Internet as free, no link required. NOTE: SHARING A LINK TO MY PAGES IS MUCH APPRECIATED. Please be sure and let me hear from you!